here's a quick recipe for a very simple meal to whip up for lunch or dinner that's loaded with amazing middle eastern flavors. 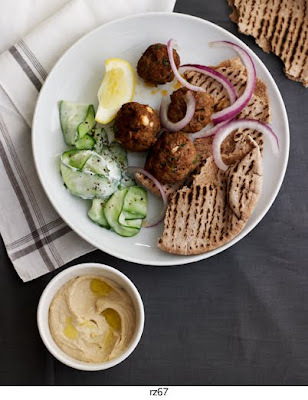 it's based on the herbs and spices in traditional lamb kofte, which are basically kebabs, and is served with a few easy accompaniments, like store bought hummus and pita, that make for a super quick meal for those busy weekday evenings. also, we've been busy working on lots of great projects like shooting for martha stewart living & styling for the nest over the past week - can't wait to share these with you! we're excited to watch this starting on wednesday and maybe we'll have to eat one of these during the game. preheat oven to 350 degrees F. in a medium bowl, combine lamb, onion, feta, mint, parsley, garlic, paprika, cumin, cayenne with a big pinch of salt and fresh ground pepper. mix well with your hands until everything is incorporated. form into about 20 small meatballs by rolling between the palms of your hands. heat olive oil over medium high heat and sear meatballs on all sides, about 5 minutes. transfer to the oven and cook 10-12 minutes or until done. while meatballs are in the oven, in a small bowl combine cucumbers with yogurt, lemon juice and season to taste with salt and pepper. serve with meatballs with cucumber salad, sliced red onions, lemon wedges, warm pita & your favorite hummus. enjoy! Sounds delicious, I love the spices used in Middle Eastern cooking. And now I must have falafel, pita and tzatziki for supper (no lamb in the house at the moment). Thank you. These kofta look amazing. I live in the Middle East and I'm always looking for new twists on old favourites. Love the elegant presentation too. I'm hungry! well, first congrats on all your amazing projects: lots to be proud of!!! This dinner looks wonderful and very appetizing. Good enough to satisfy an exotic craving without spending excessive amount of time in the kitchen. A simple lovely supper! I don't know what to say looks best, I'm falling for all of it's components. oh, man. this is my kinda meal. Mmm this food reminds me of when I dated a lebanese boy and going round for family dinners was the absolute ducks nuts; lamb meatballs and keftdes and felafels and hummus were featured favourites. love it! my kind of cuisine! came across your blog and you guys have some great stuff. all the best!